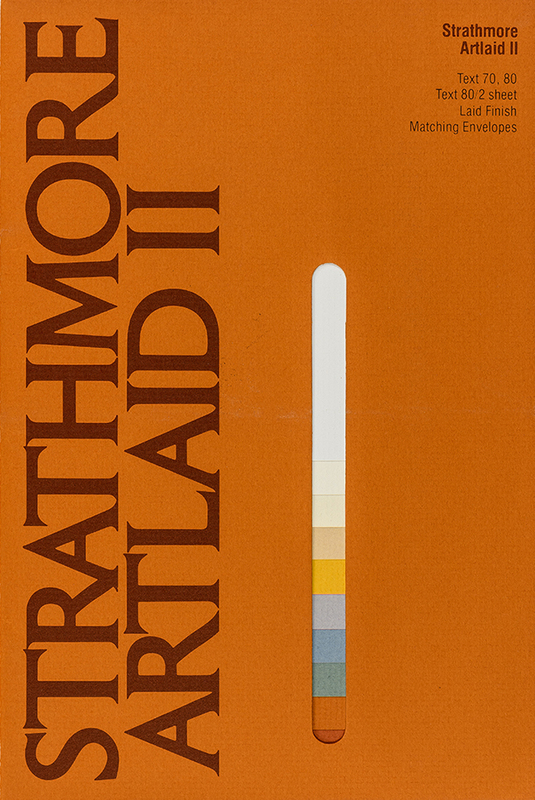 Strathmore Artlaid II watch book (Strathmore Paper Co., 1980). Designer unknown. Photograph by Vincent Giordano. “The Sixties” came to an end with the resignation of President Richard Nixon in 1974. The oil crisis of the year before inaugurated an era of economic malaise (“stagflation”) that seemed to infect the design industry as well as the entire country. In this atmosphere Strathmore’s promotions declined in creativity as the twin forces of the “Push Pin Style” and Swiss Modernism petered out. What remained was an emphasis on coordinated sets of items. Only three of which stand out: the Success is written all over Strathmore mailers, the photographic booklet introducing Strathmore Brigadoon (1976), and The Creative Tool series of brochures (1979–1983). The Success is written all over Strathmore mailers (1974), sporting solarized details of ordinary office items like pen nibs and paper clips on their covers, were clearly influenced by the Pop Art movement of the 1960s. The On Strathmore Brigadoon booklet displayed the work of fourteen contemporary Boston-based photographers: Bill Bruin, Clint Clemens, David Doss, Al Fisher, Frank Foster, Steve Hansen, Carol Kaplan, Bob O’Shaughnessy, Michael Peirce, Phil Porcella, Al Rubin, Bill Sumner, Rob van Petten, and John van-Schalkwyk. As far as I have been able to determine it was the first Strathmore promotion to focus on photography—showing how much the company’s emphasis on illustration had put it out of touch with postwar graphic design trends. Strathmore must have realized. In 1979 it began publishing a series of booklets called The Creative Tool to inform designers—who had replaced printers as the target audience by the 1960s—about technical aspects of printing on paper. This was huge change for the company. It had always emphasized the creative contributions its papers could bring to a design, not the mundane details of how to achieve certain effects. 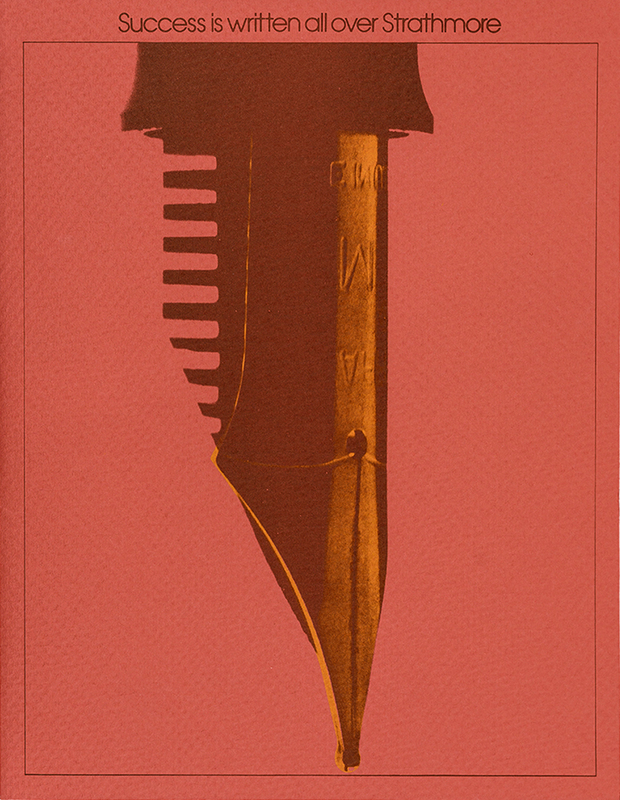 The most it had done was to provide its customer with the specifications involved in producing its promotions: the paper stock, weight, and color; typeface used; printing method; and any finishing techniques such as embossing or die-cutting. But with The Creative Tool Strathmore set out educate its customers. In this it was a follower since other paper companies, most notably S.D. Warren, had been treading this path for many decades. The series, designed by Ko Noda, began in 1979 and continued at least through 1983. Unfortunately, the Strathmore Archives only contains issue no. 9. Noda was a Japanese-born designer based in New York City. Success is written all over Strathmore mailer (1974). Designer unknown. Photograph by Vincent Giordano. Spread from On Strathmore Brigadoon booklet (1976). 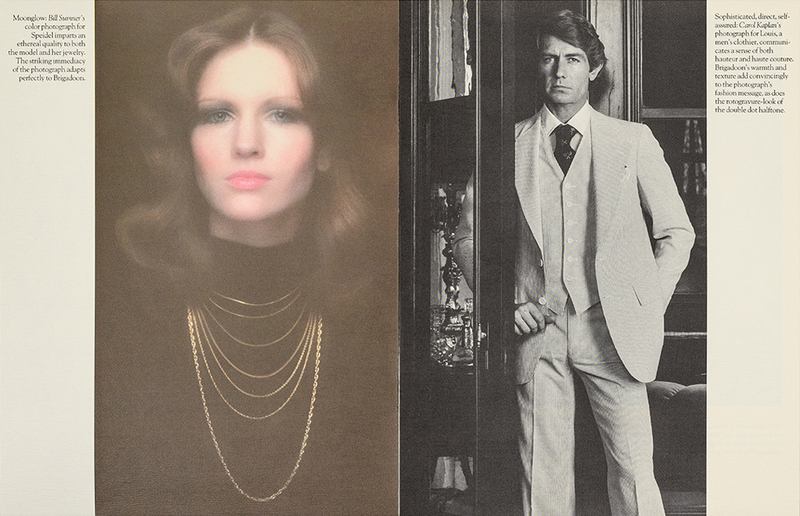 Designer unknown; photographs by Bill Sumner (left) and Carol Kaplan (right). Photograph by Vincent Giordano. 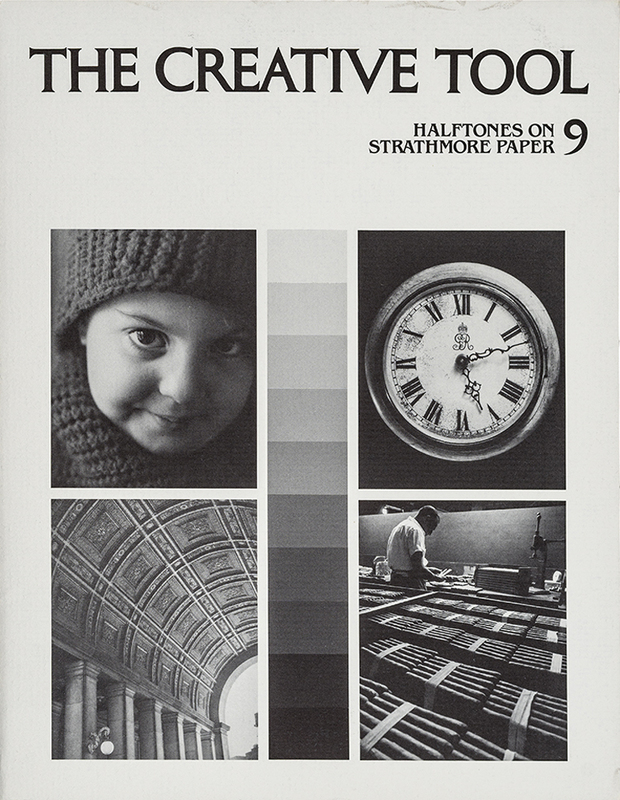 The Creative Tool 9: Halftones on Strathmore Paper (Strathmore Paper Co., 1983). Design by Ko Noda. Photograph by Vincent Giordano. Strathmore’s swatch books also lost their visual vigor in the 1970s as modernist designs were replaced by anodyne ones, notable only for the use of die-cuts to reveal the paper swatches inside. Twice in the 1950s the company had tried to standardize its swatch books with uniform designs that used color coding to mark each paper line. Those efforts were resurrected but with less aesthetic success. 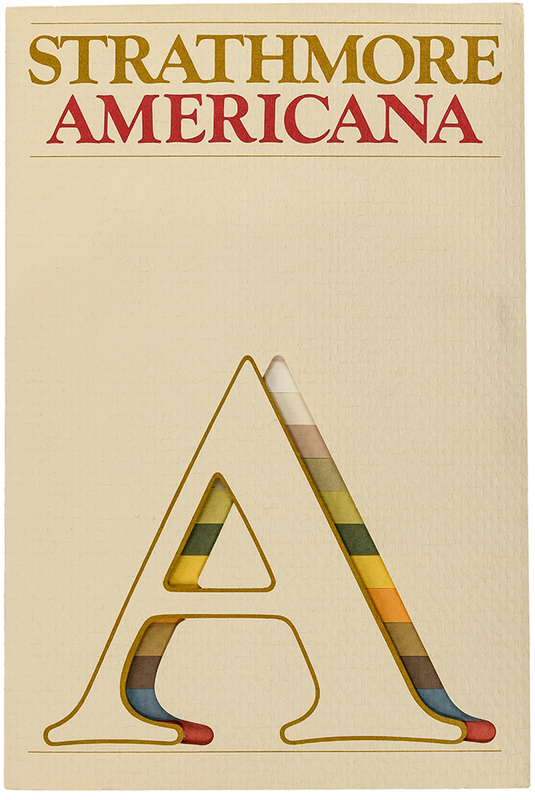 Cover of Strathmore Americana swatch book (c.1974). Designer unknown. Photograph by Vincent Giordano. The first set of standardized swatch books (1974) have large outline Goudy Oldstyle initials on the covers with die-cut “shadows” that expose the paper range. A later set of standardized swatch books (1980) (see above) kept the die-cut idea as a rounded slit unrelated to the paper name. Columna Solid, running vertically up the left side, replaced Goudy Oldstyle as the typeface. In each series color-coding of the various paper lines was accomplished by changing the color of the type as well as the cover paper. What is surprising is that neither of the two series reflected the typographic look—large x-height letters, set tight but not touching letters—of the 1970s pioneered by the International Typeface Corporation via its house organ, U&lc. Amidst the creative ferment of designs in the 1960s and the very beginning of the 1970s, two things had been lost which were not regained until the final years of the Hammermill era: the use of the thistle as a symbol of Strathmore and the phrase “Paper Is Part of the Picture.” The latter appeared on swatch books in the 1960s, but it was a pro forma gesture, devoid of any substance. And in the 1970s the phrase disappeared entirely. However, the thistle made a dramatic comeback in 1981 as a new series of swatch books reinterpreted it in a wide range of illustrative styles. 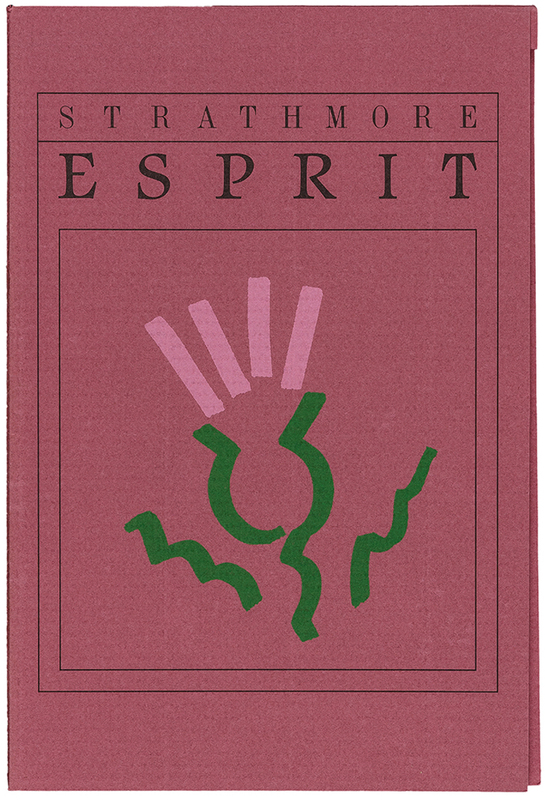 Cover of Strathmore Esprit swatch book (1981). Designer/illustrator unknown. Photograph by Vincent Giordano. 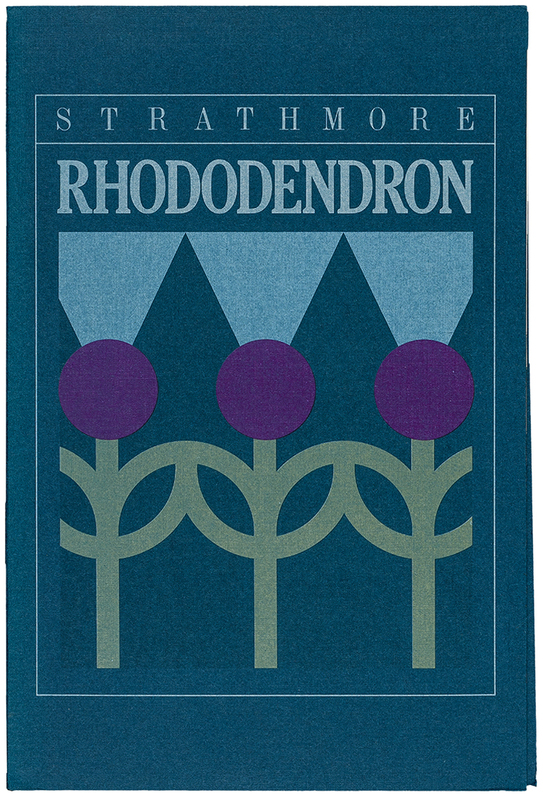 Strathmore Rhododendron swatch book (1981). Designer/illustrator unknown. Photograph by Vincent Giordano. 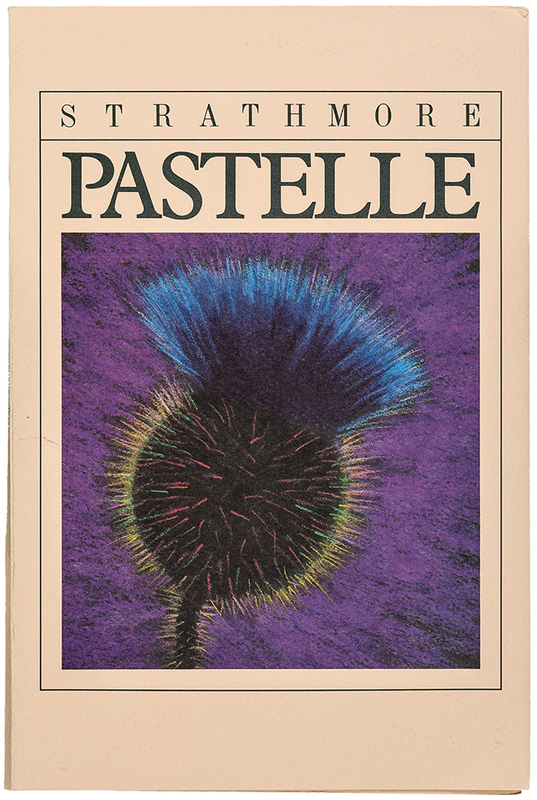 Strathmore Pastelle swatch book (1981). Designer/illustrator unknown. Photograph by Vincent Giordano. These new swatch books (which continued at least through 1984) reflected the spirit of postmodernism that was entering American graphic design at the end of the 1970s. They didn’t exhibit any of the stylistic tics of the time—such as the floating geometric shapes, squiggles and confetti found in the work of the Memphis group and California New Wave designers—but the use of seriffed typefaces (some of them from ITC) and illustrations represented a break from the modernist work that Kuenster and Danne had done ten years earlier for Strathmore. They had a uniform format, but not a uniform typographic style or illustration style. The Rhododendron thistle hearkened back to Art Deco in its reductivism while the electric Esprit thistle was in touch with the spirit of the New Wave. These and the other renditions of the thistle were as innovative and beautiful as any from Strathmore’s golden age of the 1920s. Disappointingly, the swatch books don’t credit any of the illustrators. 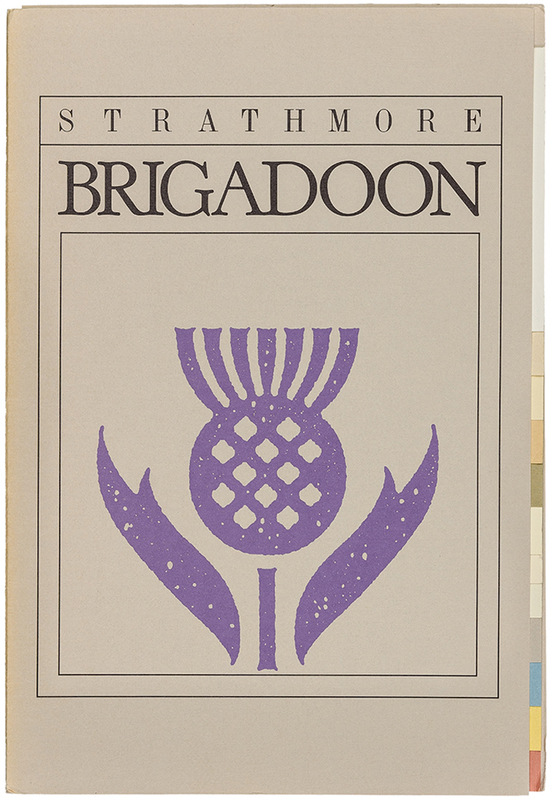 Strathmore Brigadoon swatch book (1984). Designer/illustrator unknown. Photograph by Vincent Giordano. These thistles were the harbingers of more exciting design work for Strathmore that began to appear after International Paper bought Hammermill (and thus Strathmore) in 1986. That will be the subject of the next post in this series. The Strathmore Archive at Mohawk is surprisingly weak in material from the 1970s and 1980s. The only issue of The Creative Tool that it has is number 9. If anyone has additional issues, please contact myself or Chris Harrold at Mohawk. Thanks.